Mooresville, NC (July 3, 2013) - Returning to Daytona International Speedway, JJ Yeley is looking to exceed his 10th place finish from February's Daytona 500. Golden Corral returns to pilot the No. 36 car for the third time this season. Celebrating the 4th of July weekend, the No. 36 car has a new look for the weekend - a patriotic red, white and blue design by former Marine Scott Bates. Scott Bates, a former Marine, helped to design the patriotic paint scheme that Yeley will be driving in Saturday Nights Coke Zero 400. Bates, a native of Oklahoma, was stricken with Multiple Sclerosis and is now confined to a wheel chair, with no use of his arms or legs. As a lifelong NASCAR fan, his passion has become to design race cars with his special graphic design device, that he attaches to the brim of his hat. Scott has designed a previous Sprint Car, in 2011, which Yeley drove in Phoenix. In addition to the new colors, Golden Corral will be continuing their "Top 10 Ten Kids Eat Free" promotion. Each time the No. 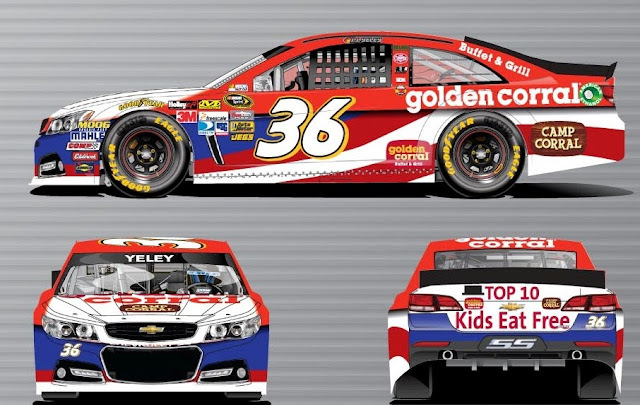 36 Golden Corral Chevrolet driven by JJ Yeley finishes in the Top 10 this season, Golden Corral will offer a one day "Kids Eat Free" promotion called "JJ's Mondays" on the Monday Immediately following the top-10 race finish. Kids can enjoy an endless buffet, with the purchase of an adult buffet. With Yeley's success in February with a 10th place finish, things are looking good for the kids eating free across America on Monday. Yeley on Daytona: "I am honored to be driving the No. 36 Golden Corral Chevy that Scott Bates designed for me. We've had a lot of great runs at the Super Speedways in the past, and I believe we will be feeding the kids again this weekend at Daytona's Coke Zero 400."